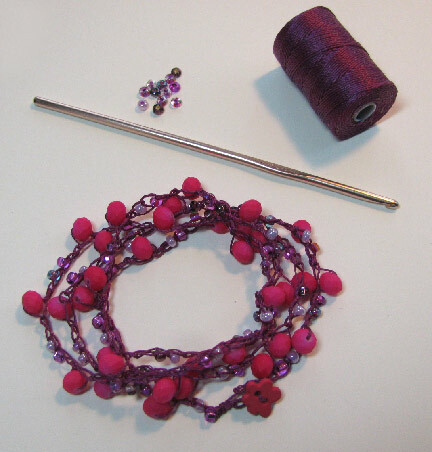 Beading Arts: Bead crochet yourself a happy bracelet! I realized it had been a couple of years since I sat down and made some crocheted bead bracelets, and now I had the perfect opportunity! The bright pink rubberized faceted glass beads. I found that one stitch was fine for each of the seed beads, but I needed to add an extra stitch on each side of the larger beads. The bracelet grew and grew, which made me really happy! I wanted one which wrapped four times around my wrist, and it turned out to be exactly the right length, without me having to add extra chain stitches. Lucky me! Such a simple, easy project...and just perfect for spring. beautiful bracelet!! the pink beads are so nice!! Love this! I've never crocheted a bracelet but I might try now. Love the look of this.